World-renowned photographers, who are experts in taking pictures of bustling marine life underneath the sea waters, are expected to conduct their master craft along the vast expanse of Sogod Bay in early December this year. Nedgar Garvez, Provincial Tourism Officer, said in an interview that the event has been scheduled on December 1-5, wherein at least 100 photographers from around the world will participate, each one bringing with them their sophisticated underwater cameras and other high-end gadgets. Dubbed Underwater International Photo Workshop, the upcoming gathering is largely seen as a major boost to the dive tourism potentials of the province, and an opportunity to promote and discover the rich potential of Sogod Bay to attract more divers of global caliber, Garvez said. 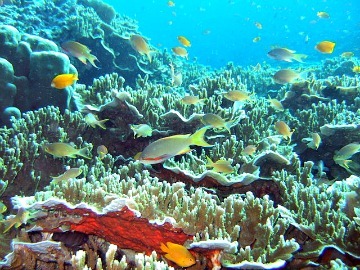 Sogod Bay has been listed as a top dive site among divers’ circles, in prime lists, dive magazines, and more discoveries of rare sights and pictures await the enthusiasts who are willing to cross long distances and time zones just to experience the thrilling, wet world several meters below the sea surface, Garvez also said. During the recent First Provincial Tourism Summit held last month, Department of Tourism (DOT) Regional Director Karen Tiopes also mentioned the huge potential of Sogod Bay dive sites, saying this has been one of the priority promotions undertaken by the agency in close cooperation with the provincial local government unit. Pictures generated from the 5-day workshop will be posted in the internet and in the individual blogs of the photographers, creating a multiplier publicity effect among their following, and this will generate more interests for passionate practitioners of the craft to come and visit the place to see it for themselves, Garvez said. In a related development, Garvez announced that an airline company, Cebu Pacific, has surveyed the Panan-awan Airport for viability in their commercial operation, and has listed specific observations as a pre-requisite to put the facility in their air traffic route as soon as possible. Garvez said most of the comments were doables, like repainting, and the provision of standard fire fighting rescue and equipment.